Born in New York City in 1893, Thompson, a "young, tart, shy blend of New England and the Bronx," graduated high school and taught herself secretarial skills. (2) In 1922, after five years with the wartime American Red Cross, Thompson joined the staff of the New York State Democratic Committee, where, working part-time, she helped ER generate a solid women's turnout for Al Smith's 1928 presidential campaign. The two women learned their crafts together: ER did not know how to dictate and Thompson did not know how to take shorthand. They quickly adjusted to each other's styles and developed such an easy working relationship that once the Smith campaign ended and Thompson began working for Louis Howe full-time, she continued to work for ER part-time. As ER's key aide, Thompson traveled with ER (often averaging 40,000 miles a year during the early White House years), helped organize her correspondence, typed countless "My Day" columns, often juggling her portable typewriter on her knees as she traveled by car, plane, boat, or train, and managed ER's frenetic schedule. She monitored ER's press conferences, critiqued her responses, and recorded key points ER made when she delivered an extemporaneous speech. "Her standards were high for me, as well as for herself," ER recalled, "and she could be a real critic. "(5) Her efficient, no-nonsense approach to her work drew praise from FDR's staff, who frequently sent messages through Thompson they were afraid to deliver in person. Eleanor Roosevelt, On My Own (New York: Harper & Brothers,1958), 107. Joseph P. Lash, Eleanor and Franklin (New York: Signet Press, 1971), 315. Joseph P. Lash, Eleanor: The Years Alone (New York: W. W. Norton & Company, 1972), 237. Joseph P. Lash, Eleanor and Franklin (New York: Signet Press, 1971), 480. 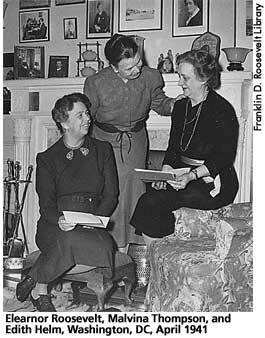 Eleanor Roosevelt, "My Day," April 14, 1953. Eleanor Roosevelt, You Learn By Living (New York: Harper & Brothers, 1960), 85.